The new John Rodgers Terminal was dedicated August 22, 1962, during the annual conference of the Airport Operators Council, held in Honolulu August 19-25, 1962. Several members of the Legislature, as well as aviation officials, participated in the dedication program. Keynote speakers were Najeeb Halaby, Federal Aviation Administration, and W. A. Patterson, United Air Lines president. On the day of the dedication, Pan American World Airways delayed its Flight No. 843 from San Francisco for 50 minutes to preface the formal program with the first commercial jet arrival at the new Terminal. All operations ceased at the old Terminal at midnight, October 14, 1962, and the first passengers from the new Terminal departed for Japan shortly after midnight the following day. The new airport, more than 14 years in the planning and building, was regarded as a $34 million investment. With its opening, Honolulu had caught up with the Jet Age. The roofed area of the new passenger buildings covered about 550,000 square feet, or roughly five times the area of the old buildings they replaced. The Crossroads of the Pacific at last had a facility that was appropriate to its rating as the nation’s ninth busiest airport. 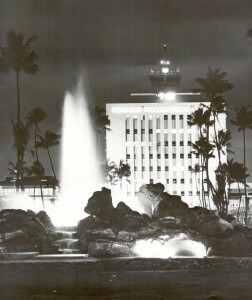 The rating had been bestowed on Honolulu International Airport by the FAA on the basis of figures for the calendar year 1962. Aircraft movements, including arrivals and departures of all types of aircraft, totaled 266,561 for that period. The problem of providing a seaward jet runway to alleviate noise to neighborhoods surrounding the airport was still far from solution. The difficulties of acquiring land and financing for this costly project appeared overwhelming. Meanwhile, fuel tankers continued to make their noisy take-offs over Honolulu. The airport hoped there would be a technical development that would eliminate the need for this flight path. 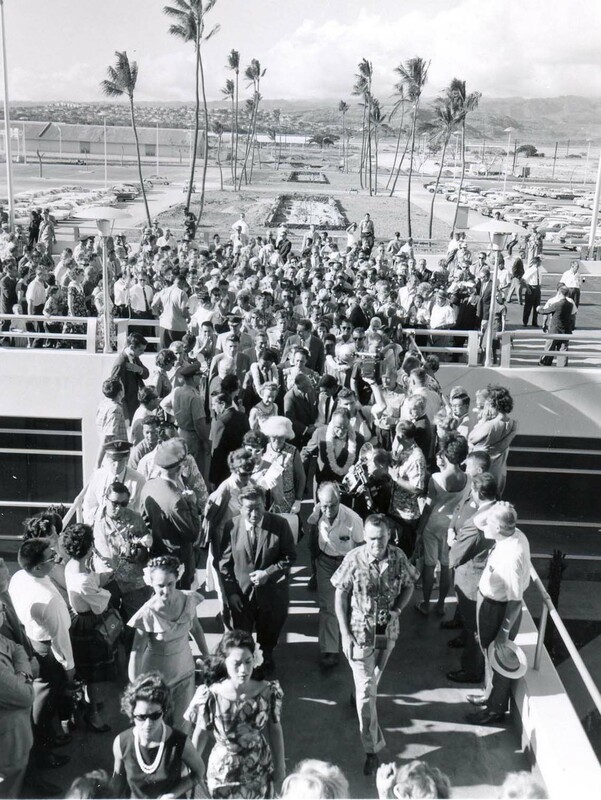 On June 1, 1962 the Hawaii Visitors Information Program was established to welcome passengers at Honolulu International Airport and Honolulu Harbor, to encourage travel to the Neighbor Islands, and to provide information and other help to airport and harbor visitors. As of June 30, 1963, the staff of the HVIP consisted of 33 full-time and nine part-time employees. On July 22, 1962, the Empress of Lima, a four-engine Britannia jet turboprop, crashed at 11:19 p.m. and burned while making an approach to Runway 8 on the Hickam Field portion of the airport. Twenty-seven persons were killed and 13 survived. It was the worst civil air carrier accident in the Islands’ history. The Air Force Fire Department acted promptly to minimize loss of life. Personnel of the Airport, Navy and City and County assisted in fighting the fire, maintaining order, and providing ambulances and other services. The crash dramatically showed the need for continued cooperation between the Air Force and the airport. Several meetings were held after the crash and a number of suggestions developed for further improvement of the pattern for eamwork. On January 22, 1963, the construction of nine pools (three with fountains and three with waterfalls), construction of a children’s playground, and landscaping of the overaseas terminal was completed. A Joint Use Agreement between Hickam AFB and Honolulu International Airport, was signed by Brig. Gen. John A. 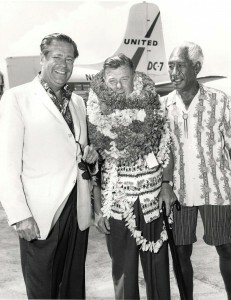 Rouse, Commander, PACAFBASECOM; and Dr. Fujio Matsuda, Director of Transportation for the State of Hawaii on April 3, 1963. 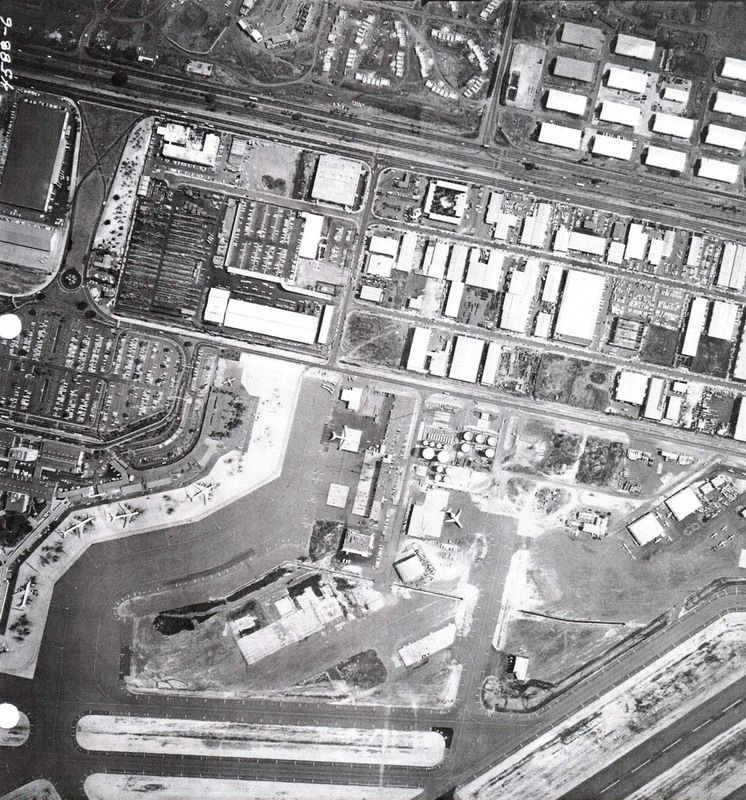 It specified that for the purpose of overall aerial and ground operation, Hickam AFB and HNL comprised a single airport complex. The continuing increase in air carrier activity at Honolulu International Airport created a greater need for a general aviation airfield in the central or southern part of Oahu, where most of the State’s population lived. Private and light plane flying would be separated from the military and commercial air carriers. So far, the State had not been able to find a suitable site for a general aviation airfield and to finance its acquisition. Because of its rather remote location on northern Oahu, Dillingham Field was not considered a satisfactory answer to the needs of Oahu’s small plane operators. A cable barrier-type arresting gear designed to save fighter planes with landing or takeoff problems was installed at the end of Runway 8. The system operates on the same principle as that used aboard aircraft carriers where a hook descending from the tail of the plane holds onto one of the cables stretched across the tail of the runway and prevents the plane from overrunning the end of the landing strip. In 1963, a master lease was signed with the major airlines present in Hawaii. This document guided landing fees, leasing fees and support charges for more than 30 years. Leases were granted to: Aloha Airlines, British Overseas Airways Corp., Canadian Pacific Air Lines, Hawaiian Airlines, Japan Air Lines, Northwest Airlines, Pan American World Airways, Philippine Air Lines, Qantas Empire Airways and United Air Lines. The term of the Airport-Airline lease was for 20 years with two five-year options to extend the lease. The purpose of the lease negotiations was the concept of airport financing by landing fees to replace the aviation fuel tax. The landing fee was called Airport Use Charge. The fees were to be renegotiated every five years. The plan provided that interisland airlines would pay a reduced airport use charge which is nine percent of the Airport Use Charge collected from overseas carriers. Fuel taxes paid by the carrier were credited against the airport use charge. The FAA rated Honolulu’s airport the 10th busiest in the nation in calendar year 1963. A demolition contract was awarded on June 17, 1965, for the removal of a familiar landmark at Honolulu International. Originally built by the U.S. Navy in World War II, the old terminal building had withstood alterations, jet blast and insect infestation. By the end of September 1965, only a few buildings housing freight and maintenance facilities remained in the old terminal area. The number of air passengers moving through Honolulu International totaled nearly 3 million. Of this total, 1,768,339 were overseas passengers passing through John Rodgers Terminal, an increase of 16.7 percent over fiscal year 1964. Interisland passengers exceeded the one million mark for the first time, 1,151,739, an increase of 13.4 percent over the previous year. Entertainer Arthur Godfrey arrived at Honolulu International on July 12, 1964 amid an enthusiastic lei greeting from more than 200 people. He was taken to an area across from the Lei Stands where a roadway was dedicated in his honor. Known as Arthur Godfrey Circle, the roadway dedication was the first of many activities signaling the start of aSalute to Arthur Godfrey Week. The ukulele-playing entertainer had been one of Hawaii’s most ardent supporters for more than 20 years. He was also a certified commercial pilot and ambassador of Eastern Airlines. Arthur Godfrey Circle was removed when the access ramps from the airport to the H-1 Freeway were built. The need to prepare Honolulu International for the imminent arrival of the new “stretch out”, “Jumbo” and supersonic jets was a matter of deep concern. Although legal difficulties were tying up funds required for master planning, staff was actively gathering information and exploring possible solutions to expected problems. As the fiscal year 1965 ended, it appeared that the State was reaching an agreement with the airlines responsible for the fund freeze. Prospects were good that the airport would soon be able to finance full-scale planning for the anticipated increases in passenger and cargo traffic. Members of the Chinese community donated a statue of Dr. Sun Yet Sen to the airport in 1965. Erection of this memorial to the founder of the Republic of China, who lived for many years in Hawaii, gave the airport’s Chinese Garden a new focal point of interest. A law suit which had been tying up funds meant to finance the new master plan study was dropped by the airlines in July 1966 so that the airport was able to complete negotiations for the engagement of the consultant without further delay. Full-scale planning to prepare Honolulu International Airport for new and larger jet planes got off the ground in November 1966, with the appointment of Leigh Fisher Associates of San Francisco, highly reputed and experienced airport planners to develop the plan. Airport planning received further impetus in January 1967 when Governor John A. Burns opened a precedent setting conference which brought together representatives of the principal agencies and elements directly involved in the operations and projected expansion of Honolulu International Airport. 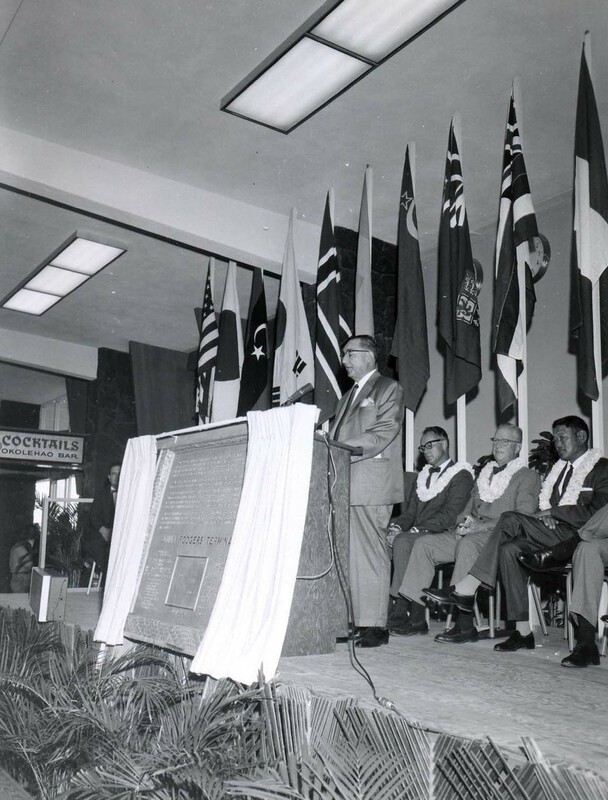 The conference developed much information of value to the consultants, and was a prelude to the establishment of a 19-person Honolulu International Airport Task Force which offered continuing assistance to the airport in the perfection of the master plan. The DC-8-61 (stretch out) was placed in service in February 1967. Pan American World Airways planned to place the 400 passenger Boeing 747 in service by 1970. Supersonic transports were expected to be flying into Hawaii by 1976. To meet these milestones was the immediate planning objective at Honolulu. Intensified planning continued in 1968 for the expansion program which would equip Honolulu International to handle the new generation jumbo jets. The increase in both passenger and freight traffic was expected from the new types of planes and from certification by the Civil Aeronautics Board of new trans-Pacific routes. The Honolulu International Airport Task Force completed its first full year of conferences and studies. On June 20, 1968, the Director of Transportation submitted the recommendation of this citizens’ advisory committee to the Governor. A summary of the technical considerations entering into the recommendations was being prepared by Leigh Fisher Associates, which acted as staff to the task force. The plan to build the Boeing 747 terminal building with second-level loading for five gate positions at the end of the Y concourse was reconsidered on practical grounds. With the first jumbo jets expected by December 1969, the Task Force decided that the original plan should be altered to minimize serious dislocation of passenger movement, aircraft fueling and servicing, and to reduce costs. The total cost of all HNL developments over the next dozen years was expected to reach $100 million. About $37 million worth of preparation was necessary to provide for the scheduled inaugural arrival of the first Boeing 747 in December 1969, and for the increased traffic expected by June 1970. Phase I improvements would increase the airport’s capacity from about four million to eight million enplaning and deplaning passengers annually. The Ralph M. Parsons Company of Los Angeles was engaged to design and manage the construction of the airport expansion program. It was the first time in the history of the State that a single firm had been engaged to coordinate all of these phases of a massive public works program. Implementation of the expansion plan was underway. New holding rooms were opened for use, baggage claim areas were expanded and modern equipment installed, the Governor’s Lounge was relocated and improved, the post office relocated and the employees’ cafeteria was expanded and modernized. The expansion of Honolulu International Airport, subject of intensive planning since 1966, moved into the construction stage on March 7, 1969 when a groundbreaking ceremony was held for the new Diamond Head Gull Wing. The first gate position of the extension was expected to be ready to welcome Honolulu’s first Boeing 747 on March 1, 1970. The groundbreaking ceremony for the Gull Wing symbolized the start of the first major permanent construction under a $38 million program authorized by the State Legislature. The 747 was capable of carrying from 397 to 490 passengers, as compared with the 251 carried by the DC-8-63 stretch-out, the largest plane then serving the islands, and about 155 carried by the 707, a standard trans-Pacific jet. Pan American World Airways was planning to place its first Boeing 747 in Atlantic service in January 1970, and to initiate 747 service in the Pacific shortly thereafter. 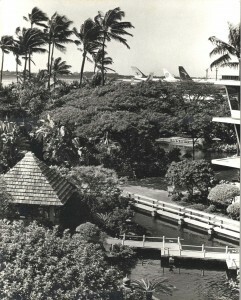 The Diamond Head ticket lobby was extended during 1969 to provide temporary facilities for airlines expected to inaugurate service into Honolulu as a result of the new Pacific air route awards. Braniff International, Continental and Western Airlines were prepared to inaugurate Hawaii operations on July 1, 1969, but the Civil Aeronautics Board announced on June 24, 1969, that their trans-Pacific route awards had been postponed. Other airlines affected by the CAB postponements in the trans-Pacific air route case were United and Northwest Airlines, which already operated to Hawaii from West Coast gateways and were ticketed for non-stop rights between Hawaii and major inland cities. Northwest inaugurated California-Orient service August 1, 1969, under the only rights made firm in connection with the trans-Pacific route case. An Air Commuter Terminal was opened near the Domestic Arrivals Area, and construction began on a temporary Foreign Arrivals Terminal between the two. Permanent car rental offices were constructed in the Domestic Arrivals section. Hawaii’s first scheduled air taxi operations involving Short Take Off and Landing (STOL) aircraft were inaugurated by Air Hawaii, using DeHavilland Twin Otters. Initially an average of four flights originated daily from Honolulu for the Neighbor Islands. This service expanded during the year. On December 18, 1968, the Civil Aeronautics Board awarded Northwest, Pan American and United Airlines additional routes to Hawaii. 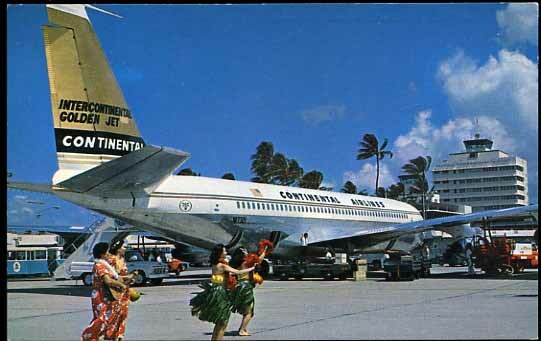 New carriers American, Braniff, Continental, Trans-World and Western Airlines were also awarded routes to Hawaii. The expansion of HNL continued with Lagoon Drive (airport perimeter road) moved to make room for the extension of Runway 4R-22L, and construction of additional parking spaces, an air taxi wing, and interisland terminal. In addition, a hydraulic model of the proposed Reef Runway was built to investigate water pollution, tidal wave possibilities, and impact on Hickam Harbor. In 1969, the Honolulu Fuels Subcommittee formed the Honolulu Fueling Facilities Corporation with financial commitments from 12 air carriers and from Lockheed Air Terminal, Inc. The corporation arranged for lease of the hydrant fueling system at HNL and hired LAT as the manager of the fuel storage and hydrant fuel system. 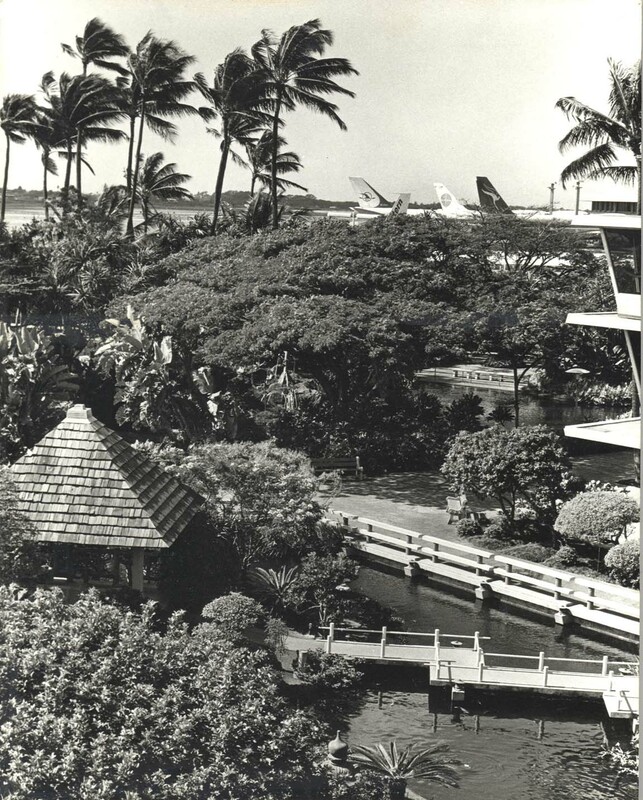 For more information about Honolulu International Airport history, click on one of the decade links below.